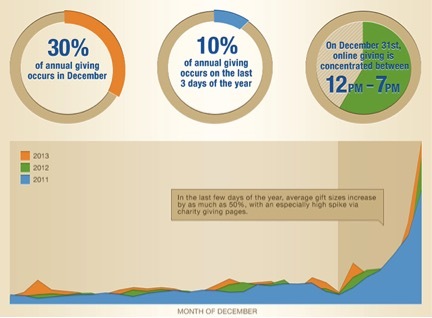 November and December are the most important fundraising months of the year for nonprofits. The giving season is just around the corner! Now is the best time to optimize your online giving platform to maximize your year-end donations this year. Right after Thanksgiving, charities nationwide will embark on the most important fundraising sprint of the year. The stakes are now even greater with Giving Tuesday on the horizon as every non-profit must think and act like a retailer, planning months in advance for one of the biggest days and months of the year. After the Black Friday dust settles, just hours after most Americans have had a chance to digest their turkey and cranberries, it’s off to the NPO races as up to one third of your nonprofit’s 12 month fundraising goals come down to the next 30 days. As such, every board member should be aware of the following December-Donation-Drivers that can make or break your organization’s annual goals. This data does not lie. Time to start now. F ) and send several reminder e-mails during the last week of December to capture those precious dollars during the those final 72 hours of the year. What are our fundraising goals for this giving season? Do we have an integrated online and offline campaign strategy to meet our goals in December? What is our process for identifying, nurturing and closing marketing qualified leads and sales qualified leads? Do we have a mobile optimized website to meet the demand of the 80% of our constituents who own a smartphone? Do we have a qualified team to execute the campaigns to meet these goals? 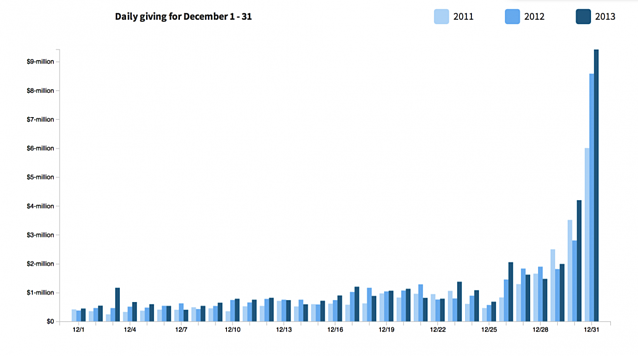 Donors who start giving in December are worth more over time. Over three years, the total amount they give is 52 percent higher than people who start giving at other times of year, according to Network for Good. Couple that with a 200% increase in donations by mobile optimizing your site, and your foundation can be poised to more than double their December fundraising efforts.